“I was so happy to find the Jews!” filmmaker Gabrielle Zilkha exclaims when discussing her 2010 trip to Ghana, originally slated as a volunteer opportunity. While working with local communities Zilkha – who notes she isn’t particularly religious – became homesick not just for her loved ones back in Toronto and Montreal but for the Jewish faith that connects them. Then, as if the spirit of the upcoming Rosh Hashanah holiday intervened, Zilkha learned of a remote community – Sefwi Wiawso – about a day away from where she was staying that practiced Judaism. And even more incredibly, they didn’t even know anyone outside of their community knew of the faith until a few decades ago. Zilkha filmed the discovery and her interactions with the community, as well as her own growth and journey within and about the Jewish faith for the upcoming documentary Doing Jewish: A Story from Ghana, which airs Monday, May 30, 2016 at 9pm on VisionTV (a ZoomerMedia property). Recently, Zilkha discussed her trip, what she learned about her own Jewish faith and the difference between being Jewish and doing Jewish with Zoomer. MIKE CRISOLAGO: You were volunteering and filming in Ghana when you found out about the Jewish community in Sefwi Wiawso. What vision did you have for your original film and what was your reaction when you realized that you’d uncovered this other, extremely intriguing, story? GABRIELLE ZILKHA: My first few months in Ghana I was seeing everything with “tourist eyes” – excitement and wonder. The sites, the sounds, the smells, the culture, the language, the food was all so new and interesting to me. As a foreigner, I sought to take in and understand my surroundings as much as possible. As a filmmaker, however, I was always in search of a story. And there was no lack of stories around me. Before meeting the Sefwis, I was investing my time, research and interest in a very important national story at the time – the onset of off-shore oil and gas extraction (this was in 2010) … But almost immediately after meeting the Sefwis, I knew this was the story in Ghana I was meant to tell. I was moved by my experience in their community and I had a personal link to the topic. Thankfully, after getting to know the community over several visits, I was entrusted with their stories and access to their lives – something I am deeply grateful for. As for my reaction? Well I got straight to work! Researching, writing and filming. MC: In the documentary you note you aren’t very religious but that being so isolated from Jewish customs made you feel more alone. How did this trip and documentary affect your faith and/or connection with the Jewish religion? GZ: They say you don’t know what you got ’til it’s gone. I wasn’t in search of Jews per se but I was in search of a sense of familiarity and comfort. Growing up in Montreal and moving to Toronto, visiting synagogue or connecting with Jewish communities … I always felt a little bit like I didn’t fit in. Yet, here in Ghana, I realized that I took this identity and the connection that it has brought in my life, for granted. This whole experience has been a profoundly transformative one for me. It has strengthened my understanding and awareness of my Jewish identity and my relationship to this identity – what does my Judaism look like? How does it manifest itself? What do I like about Judaism? What do I reject in Judaism? It was and is a deep personal exploration. MC: And in the doc you also raise an important distinction within the faith. What I learned from the Sefwis and through my journey is that Judaism does not survive over millennia through passive association or the odd bagel and cream cheese. It takes effort, it takes action. For me, connecting with the Sefwis has made me want to slowly incorporate more Jewish ritual and study in my life. MC: The Sefwi community hasn’t officially converted to Judaism by the standards of some in the west. How important is dialogue around this is in terms of connecting communities of faith around the world? GZ: To me, this dialogue is necessary to maintaining an evolving, inclusive, relevant and engaged network of Jewish communities. To me, consensus is both unlikely (just visit my house for a Shabbat dinner if you need proof) and not what I see as most meaningful. Dialogue in and of itself is a meaningful outcome. It is a step towards pulling our otherwise diverse, globalized communities ever closer to one another. In this sense, Judaism becomes this thing that can force us to focus on what we have in common rather than what pushes us apart. It connects us to people half-way across the world or, as is often the case, across the dinner table. There is a wealth of knowledge and growth that comes from the connection of different Jewish communities – regardless of whether they are established Jewish under a mainstream denomination or not. MC: Has anyone from the Sefwi Wiawso community seen the film and, if so, what was their reaction? GZ: Not yet! It’s killing me! Gosh I hope they like it. We made a deal that if they don’t they’re not allowed to review it on Rotten Tomatoes. We are sending a bunch of DVDs with a kind gentleman I met at a 3-year-old’s birthday party who happens to be travelling to Ghana. Who knew a 3-year-old birthday party would make for such a fruitful networking opportunity? I’ll never turn one down from here on in. MC: Do you have plans to search out other remote Jewish communities around the world? GZ: Not as a film project. I think I’ve reached my “films about remote Jewish communities” quota. And for me, my relationship with the Sefwis is a lifelong friendship that will likely involve multiple projects and I’d like to continue nurturing that. However, when travelling I will be more inclined to add “find local Jewish community” onto the itinerary from now on. 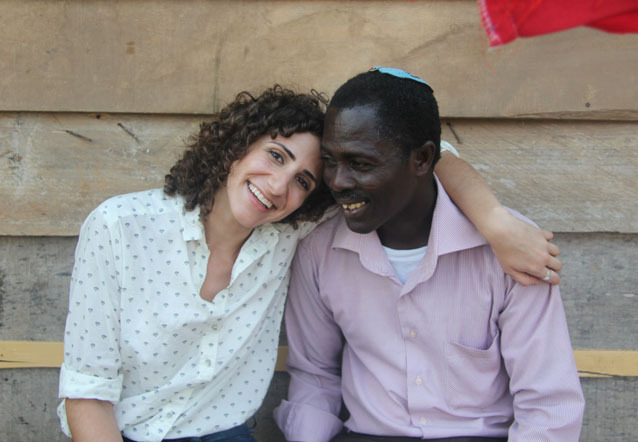 Doing Jewish: A Story from Ghana airs Monday, May 30 at 9pm on VisionTV.